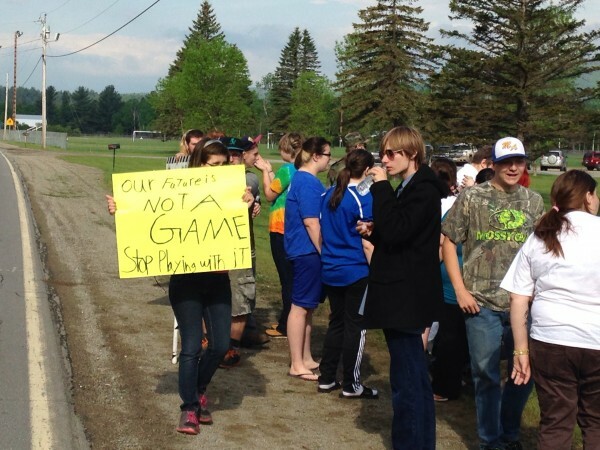 Approximately 25 students staged a walk out and protested along Route 142 this morning. SALEM - Motorists driving past the Mt. Abram High School this morning were greeted by approximately 25 students holding signs alongside Route 142, following a walk out to protest the school board and stalled teacher contract negotiations. Organizers of the "Mt. Abram Angels" said they developed the idea after seeing other schools conduct sit-in protest events. Junior Dakota Bailey had the idea of conducting a sit-in at Mt. Abram, but other members suggested walking out instead. The students organized themselves over Facebook under the direction of four "Archangels" and claim to represent approximately 150 of the 275 students at the high school. Two protest organizers, Brandon Haines and Brooke Brown. "We're willing to accept the consequences to be here," organizer and sophomore Brandon Haines said. He said that other students supported the effort but had been unable to attend the event due to them being seniors working to graduate, Foster Technology Center students attending classes in Farmington, or being asked to remain in the building by staff. Haines said the Abram Angels were advocating for two causes: the complete "reconstruction" of the school board, which would include replacing all 14 directors and settling the teacher contract issue. While the Angels didn't disagree with all of the directors all of the time, Haines said, they held the entire board responsible for previous decisions. "If they haven't worked in the past," Haines said, "they won't in the future." Teachers represented by the Mt. Abram Teachers Association have been working without a contract since the end of the 2012-13 school year, with negotiations and an arbitration process stretching over the last three years. The district and association are agreed on most points, including wage increases, with health insurance premium coverage and a guarantee to avoid salary freezes during negotiations remaining the two sticking points. The school board supports a 5 percent reduction in district contributions to health insurance, with teachers picking up 85 percent coverage of individual's premium and 75 percent coverage of a family plan premium. The association has proposed 87.5 percent and 77.5 percent rates, respectively. Both sides have cited arbitrator recommendations in support of their positions: the school board's 5 percent reduction was recommended by a three-member arbitration panel in 2014, while the association's proposal is positioned midway between that recommendation and the 0 percent recommended by the Maine Labor Relations Board in 2013. The association also wants to contractually prohibit salary freezes during future negotiations. Historically, the board has not implemented salary freezes, which prevent teachers from receiving step raises after a contract ends, but had not been contractually mandated to do so. In a statement released last month, the school board said that a contractual prohibition on salary freezes was not common in school districts and the issue could "contribute to another prolonged negotiation." The prolonged negotiations have led to tension between some members of the MSAD 58 communities and the school board. A petition calling for board member Daniel Worcester's ouster as chairman has been repeatedly cited at recent board meetings, with the board responding by decrying "recent attacks on the chairman of the MSAD 58 Board of Directors" in its April statement. More recently, Mt. Abram High School math teacher Brian Twitchell informed the board that he intended to seek employment outside of the district, citing a recent change in his previously-held opinion that the board and community "valued and honored the dedicated teachers of this district." Tuesday, protesting students said they also wanted to see four student-director seats on the school board, one for each MBHS grade level. Non-voting, student representatives are common on Maine school boards, and the MSAD 58 board has recently discussed adding students to the board. Freshman student and Angel organizer Brooke Brown said that she didn't believe that "the school board had much interaction with the students," a sentiment that a number of other students at the protest echoed. "How can they affect our education if they're not here?" Haines said. At one point, Principal Marco Aliberti emerged from the high school and spoke with the students. After saying that he "appreciated their thoughts and concerns," he expressed concern with the unattended students and their proximity to the road. He offered to bring any students that wanted to leave back into the school, and then took the names of everyone in order to contact their parents. The students, who in most cases said their parents were aware of their intent to protest, stayed by the road and provided the information. Students said they intended to come to school the next day, per usual. Students protest along Route 142 this morning. The student protest has lead to suspension for the kids involved. I don't think that they should have been next to the road. But I also believe in freedom of speech and expression. While the kids are protesting for their teachers and school, the superintendent is passing out punishments and threats, like detentions, suspensions, and telling Seniors they would not be able to attend graduation. I think the school could have handled this better than they did. Perhaps talking to the students and try to understand their fear of losing the teacher's they've come to love, and the possibility of having to attend a different school if Mt.Abram was closed. School's have way too many politics involved, it seems we have lost focus and priorities have changed. I believe if it had been planned out better the students could have still made their respective point without getting into trouble. First of all, what kind of respect is shown to the teachers when you walk out on their class? (Makes no sense) If they had done it immediately after school or before school there wouldn't have been the controversy. I don't believe the school can penalize you for something done outside of school hours. These students should be punished for the rules they broke. They made their bed now they have to lie in it. That's what happens in the real world. Unless somebody knows the school board, principal or even teacher is acting in a manner that exceeds their job description, there is not much to be done. These students definitely have a 1st amendment right to exercise but we all know sometimes there are consequences when we practice that right. What I hope this brings is more conversation students shouldn't be worried about their teachers leaving or the fact they don't have a contract. Students should be worried about the education they are receiving. Seems to me as if it is time for the School Board to wake up, and focus on what is truly important education! Good for you Kids!!! That's YOUR school and YOUR education ...you stand up for whats yours!! !...Here lies the problem with politics of ANYTHING the wrong ones always pay the consequences ...all those kids have my utmost respect!!! And as far as I am concerned show up for school just the same stand together as one let's see how the administration deals with that! No contract since 2012-13 school year. Yet the teachers taught and the teachers still got paid for doing so. I fail to see the big deal here. You work, you get paid that's how it works. If they have been working for the last 2 years with no contract, then keep working with out it. It should be as such, here's what the job is, here is what it pays. End of story. No contracts, no union BS. Students should be taught about union greed, not involved in it. Do the job you're paid to do or quit. Come on! Don't burn down the whole forest to get rid of a few diseased trees. They will eventually weed themselves out. Go back into the school, sit down, shut up and get an education while the adults work this thing out. SHAME on the MSAD58 school board for allowing this to come this far. I am an alumnus of Mount Abram High School and I ACTIVELY support the ouster of the entire school board. this hullabaloo has gone TOO far. how many programs have been cut from Mount Abram in the last 15 years, while "pet" projects of the school board get funded? The windmill installed in 2008? new lights for the soccer field? new baseball field? teachers in Maine are among the most underpaid in the nation- enough is enough. stop treating our kids like your entertainment and a buff to your resume and start doing you JOBS. As much as I did not want to be at school I think these kids did the right thing and who ever suspended them should be ashamed. Freedm of speech was a topic we talked allot about at MT Abram. If this was going on when I was there I'd have been right by these kids side! You know what is funny. When I went to school there many years ago, the teachers were pretty much the same as the ones my parents had when they went to school there. And this issue, is nothing new. When the students give an have a voice at Mt. Abram, the staff will find ways to shut them down, give them punishment, instead of taking the opportunity to learn, build on what is going on and how to approach problems, lets just shove it under the rug! The school board does need some remodeling, has needed it for a long time. Students until you graduate and are able to take there places , there really isnt anyone who can take over. Stand your grounds, prove your points, but above all remember to learn from each day. Why don't u run for school board becca? then get all the other whining ones run for it, then see how good of a job you all do. All 14 board members are doing their job. Just because a few don't like the chairman or some of the members you all want them ousted. The chairman only has one vote like the rest of them. I believe everyone has a right to speak..but there are consequences if done at the wrong time. What does the handbook for mt Abram say about putting on a demonstration? The teachers are still being paid and they teach. Yup, Maine probably is one of the cheapest states for teachers pay. Well the economy sux in Maine too...so if the pay isn't good enough go to another state. At least you got jobs! It's kind of sad adults "teachers" can't fight their own war and drag the students into it. They have a union to fight for them. If you feel like you need to fight for the teachers then do it but they are Adults and should fight their own fight. Hey here's an idea, why don't the teachers stand out by the road and protest? Don't let good hearted kids fight your battle. The attitude of put-up and shut-up is what drives good teachers away more than the pay does. The board and the community say that they want the right to keep the best teachers and then they drive away the very talented young teachers they claim they wanted to keep with negativity and hostility. These are not threats but actual resignations that are hurting kids. I have seen training schools and they are not pretty places. The kids know that most of the good teachers will stay for a couple of years and then move on and the ones who will stay are the ones who cannot leave for a variety of reasons. That is not good for kids and it will not be good for the community as those of us who value education will leave or send our kids to other schools, placing a higher tax burden on the towns as they lose revenue. When I was in school we had nothing to do with the inner workings of the school. Isn't this asking our children to do our dirty work? I went to that school from 2009-2013 I loved all the teachers and everything about that school. A lot of the students there still are some of the teens that I left there and some are graduating this year. I believe what they are doing is right. I believe that the students should fight for what's right. That school is more then just teachers teaching students and students just there to listen. It's about being a family. Every teacher there loves their students no matter what and the same goes for the students. Teachers listen to a students problem and they try to help them. Mountain Time is a time where kids go to a room with up to like 15 students in it along with one teacher. They play games, watch movies, do homework, go outside (when the days are good) and just have a good time. That's a time for students to unwind and have some fun alongside the teacher that looks after them for 30-45 minutes every day. Karen has it right. Getting suspended for expressing an opinion for 1 day after hearing what they have heard from board members and respected teachers is not justice. This is still America but it often seems that every thing is working to create a compliant citizenry. Just a quick fact: soccer lights funds were fundraised and equipment to put them up were donated. The new baseball field was totally donated by a local contractor, so these were not pet school board projects. I happen to be one of those parents looking for some changes on the school board and I find it offensive that some people would assume that it must have been one of our kids out there protesting. I have a very strong opinion and I have taught my kids to also stand up for themselves and what they believe in. If you attend school board meetings you will see my kids and other kids of said parents. They are there listening to what is going on. Trying to get a grasp of everything just like myself. They know that if they have something to say they can say it. As a matter of fact they have done so in the past. The teachers were not behind this protest in any way and they have been fighting their own battle. Please get your facts straight before opening your mouths. These students felt strongly about their own opinions and acted upon them. Right or wrong they did what they did on their own. It absolutely is true that you have a right of speech but also remember that with that sometimes comes consequences. These students had been discussing this for weeks, talking with each other and knew their rights and the consequences of those actions. So please I know many of you have heard this before. Stop assuming you know all the details. Know that when you say something, your twisted stories and accusations are only spreading the fire instead of trying to help put it out. Opinions and truths are like night and day. Let's work together to find the truths! If you want to make a difference come to the budget meeting being held this Thursday at 6:00 at Mt. Abram High School. See for yourself what is going on and help make our district a better place for our kids and our towns futures. these negoiations have gone on so long its really not teaching the children , its as bad as our government , good lord its all about ego's ,mature , grownups , where are they . students of mt abram I am from class of 1977, leaving class is , disrespectful , but did it get attention well id say yes , so is it wrong to be heard, no I wouldnt say so. those of you that did it put your heart into it I applaud you, those of you that did it just to get out of class if there were any hope there wasn't . These are not students fighting for or doing the teachers dirty work. These are students who want to preserve what they have. They want to save a school that they are afraid will close. We should applaud their effort of civil discourse and praise them for doing it knowing there would be ramifications. We want to raise young adults to think and be active members of society. Yes maybe they could have planned it before or after school but they were willing to accept the consequences of their actions....isn't that more than we can say about some adults. Anyone yammering about the 1st Amendment rights of these students needs to educate themselves. Students don't HAVE 1st amendment rights in high school, with few exceptions (namely where there's no educational relevance to the topic, of which this was clearly the opposite), and *specifically* when it has to do with the school itself or its operation. Please look up Hazelwood v. Kuhlmeier and read it before commenting further. "...a school must be able to set high standards for the student speech that is disseminated under its auspices -- standards that may be higher than those demanded by some newspaper publishers or theatrical producers in the 'real world.'" In addition, the ruling contains broad language on what type of speech school officials may censor, including any speech that might "associate the school with any position other than neutrality on matters of political controversy." I'm not defending or advocating it, I'm saying the suspensions are by the book and these kids have zero ground to stand on. The letter of the law is right there in black and white. Teachers are the ones that hold the KEY to our nation's future - we may want to treat them half decent so individuals who care about others and are genuinely wanting to inspire kids, continue to choose the profession ---- I know many of my own friends chose not to pursue a degree in education because they felt it was a thankless job. Everyone thinks they can do it better ---- I challenge those people then to go get a four year college education and try to do a better job. Stop with the negative comments and for goodness sakes just get behind one another. I used to be proud of where I went to school. Now I'm embarrassed. Completely mortified. The ignorance is thick.... People "don't much like that there book-learning at Mt. Abram - those darned teachers are at it again - trying to make kids into better human beings.." Unreal. It's an embarrassment and I can honestly tell you as someone who now lives away - our area is a laughing stock now and it's a shame. Instead of being known for its hard-working, caring people who take care of their neighbors (including teachers), that area is now known for its ignorance. Way to go. 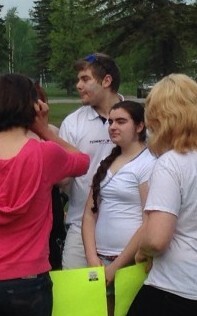 If anyone caught this on camera, please forward to WABI-TV5. They are asking the public for news story ideas. There's no debate here. No ambiguity. The article is about 25 students who irresponsibly chose to leave class and deliver their uninformed opinions via poorly-written signs (Seriously, are we all looking at the same pictures?) to an empty street. It accomplished nothing except depriving them of more education they all so obviously need. "Anarchangels?" Really? This is comical. These kids aren't out there putting flowers in the guns of riot police. They're skipping class to get a photo-op and some time off. Do a LIVE interview with one of them -- JUST ONE -- and see how well-informed they are about what they're protesting. I guarantee you don't get anything resembling a coherent answer. Used To Be is absolutely right, but there are still many things to be proud of in MSAD 58. The problem is only with the school board; the trickle down effect stops there. Even our new superintendent who was hired to whip everyone into shape, didn't realize that she was supposed to kick people when they were already down. It shows some integrity, actually, that she refuses to continue to do the dirty work of the school board. Part of the school board. We have some dedicated board members who, daily, try to stop the contagious, pervasive, negativity and disrespect that is the driving force that is killing our district. I just wish these few board members would've removed the problem sooner. Our administrators are phenomenal....they know our students and what they need. Of course it's costing us loads to replace them because they have always happily gone above and beyond what their job description and pay rate has required of them. Our teachers are committed, caring, and inspiring. Our students at MTA are eagerly signing up for next year, excited about the course offerings. Our extra-curricular activities are engaging and our facilities are beautiful and welcoming. All this strife has been going on for so long, but it is not in the forefront of students, teachers, or administrators minds when the bell rings. Business as usual....education. So, get involved and learn what the issues are that our district is facing and let others know that there's still so much to be proud of here, perhaps even more than you realized, since great things are happening here right now despite these challenges. Good teachers would not have allowed this to happen. I see two issues getting confused as one. Teacher contracts and Kingfield withdrawal. How does MTA closing have anything to do with the teacher contract and the school board? If Kingfield chooses to withdraw, that is a town decision. Not sure how much the students know about that. My kids go to MTA and the teachers do talk about their issues to the students, in the hallways and to individual students. My kids come home and tell me what each teacher says. Please Leave it at the front door professionals. Who is in charge of teacher behavior? That in itself is bad business. I agree that the students concerns need to be heard. There is a better way. When will certain school board members listen? Are you Mr Moderator? With respect you are incorrect. Hazelwood involved the question of whether students had free speech rights in a school sponsored and controlled student newspaper. Even in that forum the court did not hold that students had no first ammendment rights only that they were much lower than when students excercised those rights independent of a school sponsored forum. You correctly cite a section of the decision which specifically indicates this fact "for the student speech that is disseminated under its auspices" but seem not to grasp the import of the quote. It is only that speech that is issued from a forum established by the school, e.g. school district sponsored newspaper, newsletter, bulletin board, p.a. announcements etc. The court was explicit in distinguishing this school sponsored speech from independent student speech where the school district is not a participant in the publishing or dissemination of the speech. There are a long string of cases beginning with Tinker in which the court famously held "students do not shed their rights at the school house door"
As noted these first amendment rights are not only present for students but so strong that they can often overcome the school's right to impose disciplinary action. The current test is that if the speech is delivered in such a way that it neither disrupts nor can be reasonably anticipated to present a danger to the orderly operation of the school then the school is barred from disciplinary action. The student speech in this case did disrupt the orderly operation of school and therefore would not be protected from disciplinary action. I hate to take the focus away from the article, but Heavy Taxpayer brought up the Kingfield withdrawal. Anyone considering this, must be thinking, "If Stratton/Eustis can do it, why can't we?" Please consider that the Stratton/Eustis community has a long history of supporting children through its Summer Rec program that is funded by the town and has been happening for something like 3+ decades. The rec programs in neighboring towns are short bursts of energy that fizzle out, unfortunately and understandably. Kingfield residents, if you try to go it alone, be aware that Stratton/Eustis is paying almost DOUBLE to educate its children than it did when it belonged to MSAD 58. Are you seriously thinking that your taxes will go down? Not to mention that you won't be sharing any resources such as music, art, special education directors, speech/OT therapists, the superintendent's salary with anyone? The list goes on and on. You WILL be going it alone. And for what? More representation? Wrong again. You will be tuitioning out your high school students and that will cost more than the state sanctioned rate and you won't have anyone representing those students (at Mt Blue or Mt Abram). Those of us that do not live in Kingfield understand your frustration, especially that your selectmen offered a TIF to a company that was already knocking at your door, thus reducing financial benefits to your town. Pulling out of the district, however, is not the move to make. Stay strong. The kids are in trouble for walking out for the teachers, would the teachers walk out to defend the students? Captain Planet - as stated in the article, many of the students' parents knew about the plans to leave the school and protest, and as stated, many of them encouraged and were positive about the idea prior to it happening. So, then shouldn't your comments (although I disagree) "good PARENTS and teachers would not have allowed that to happen"?? If your theory/idea is sound, it should include ALL parties that could have stopped this from happening, rather than - once again - putting all the responsibility and blame on teachers. Guess what, a kids' most important "teacher" is right at home... And yet some individuals still blame the classroom teacher for all the world's problems. If you're blaming teachers for allowing this, you should also blame the parents. And that, once again, sheds light on another topic of concern - parents have no accountability for their childs' actions - and it's always the fault of the teacher. If you're arguing that this should have been stopped - it could have been "stopped" at home through a conversation by the parents explaining why it shouldn't have taken place. If that's your argument.... Point the fingers at the right people - point them at home - where it all begins. @ doubt it.... I am not a Mt. Abram teacher, but as a 30 year veteran teacher, I can answer that one with an absolutel YES. I HAVE and would continue to walk out to defend my students. Obviously, you re not familiar with the heart of a good teacher. Some of the information here is completely wrong. The 25 students outside don't really represent 150 of the 275 students in the high school. The reason this is said is because the entire junior class doesn't care at all. I'm a Junior myself and have spoken to everyone that I know. Each of them disagree with this and don't care, there's only two juniors outside, while everyone else is inside. Missing school for a childish act, is not worth it, so why do this? Some people and students just don't understand that Mount Abram is going to be going soon, it's a given no matter what, whether the problems are fixed, or aren't. So why fight? Yes, you're learning to stand up for yourself, but adults are at play, and they'll fix it soon, they've got a whole summer to do it, so just leave them alone. Besides, the teachers that are leaving, just announced they were, they haven't officially said, 'Yes, I'm leaving', most have just said, 'I've got applications out there, but I'm not leaving yet', meaning that most of them might be there next year. So, just, leave it alone, and get back to class, you're gonna end up failing if you don't come back eventually. This one day standout turned into a two day for some of those that were suspended due to protest yesterday. So they suspended the kids for walking out? Why? because they didn't like what the students had to say? Did the kids actually violate any school rules to earn the suspensions? If the parents approved that should count as an excused absence NOT a reason to suspend the kids. But hey if you "punish" these kids for exercising their first amendment rights then you will have the effect of chilling free speech! I'm a MTA alumni and am appalled these kids were punished for standing up for something they believe in! To me- these kids showing an interest in civic events is what education is all about - preparing our kids to take part in the world at large! Good for these kids & their parents! You also are not representative of the whole student body. Many students agreed with the protest, just not with the timing. Many also felt that although the idea was a good one, giving Mr Aliberti one more thing to deal with would not be the best way to show him their appreciation and support for all that he, the other administrators, and the teachers do. Please don't give in so easily and be complacent about a fate for your school that you don't agree with. The majority of the students do care about what's happening in MSAD 58 even though they express their concerns in different ways. You may have asked them how they felt about the protest, but not their feelings about our district. My best advice is to take your parents to the budget mtg at 6 this Thursday and share your feelings there. Good for these kids who are standing up for the teachers they respect! I am not an alum of 58, I am alum of 9. When I was in school at Mt. Blue, we were often encouraged to stand up for our beliefs, at least in my experience. It is sad to see people ridiculing these teens for doing the same in their district. It seems like "letting the adults handle it," isn't getting these teachers very far. Let the students speak. Yes, they are getting a free public education, but that does not mean they shouldn't have a voice when it comes to how they are taught. It is their futures on the line. I commend them, and I commend their parents and teachers for supporting them. Obviously they did something right, because this is the first time I have heard about rsu 58's problems, and it is because of these young people. We should be giving them praises for organizing a peaceful protest and spreading the word, not condemning them for skipping class. A lot of kids skip class. Most don't do it to stand up for their beliefs and their school. One day suspension and these kids could of taken a beach day. It is pretty humid out there. But NO, they are right back at it! This is truly a cause that they believe in. Well, my comment from yesterday was removed...as usual the many controlled by the few. I removed my child from this school system and have not regretted it! There isn't a day that goes by that I'm not thankful I made that decision and many of these comments just confirm I made the right decision. I recognize so many of these names from different boards around and God forbid you disagree. There is and has always been an air of cronyism in this area, especially this school district. Used to be proud of MSAD 58 is spot on. Big fish in small ponds are just that...big fish in a very small, sheltered and closed minded pond. I constantly hear people around here complain about the situation, but they are too scared to speak publicly or to stand there ground due to the environment of intimidation and bullying. Are there some great teachers in the district? Yes, and they really care about the students. How long will they stay and continue to be bullied? In closing, I hope Kingfield does pull out of MSAD 58. It may mean more money in the long run, but at least they will have the freedom to run their school without the ignorance, cronyism, intimidation, and bullying that has been accepted as the "Status Quo" around here for years! I don't care if you were the captain of the soccer team in 1967 or if your family owned half the towns in the 1960's...that was then and this is now. Deal with needed progress and deal with the now. Please come to an agreement, speak up, grow back bones, stop forcing teachers on three week paid leave for stepping foot in Dallas, Texas and stop making us the laughing stock of Maine. We are right up there with Fort Kent and the Ebola nurse. You can fly your " I love our community flag" all you want, but at some point you have to admit things need to change and that you may actually be part of the problem...not the solution. The fact is the school board has members that don't support the existence of the schools. A sand pit would be better use of the land, according to some. It's too much money to do it right, to pay for quality, experienced people. Whether this is the will of a few with a private agenda, or this board represents the true will of the communities, the result is the same; this district as it exists now is on borrowed time. This conflict is not about a couple of percent of health care costs or raises, it's about a board who believes it has a mandate to cut things to the bone and beyond. Maybe they do have that mandate, as painful a truth as that might be for some to accept. We had a golden opportunity with the hiring of a new superintendent, but the board chose to hire someone to fight for them, instead of heal and rebuild the district. If disintegrating the district is what the people in the communities want, the teachers are fighting a battle they can't win. If the people in the communities of MSAD58 support the idea of maintaining a school district, you need to make that crystal clear to your school board representatives, and also be prepared to pay the costs associated with running a district. If not, let's just acknowledge the facts and move on. Let's close the schools and stop bleeding money to the lawyers. Let's either heal and rebuild or tear it down and move on.